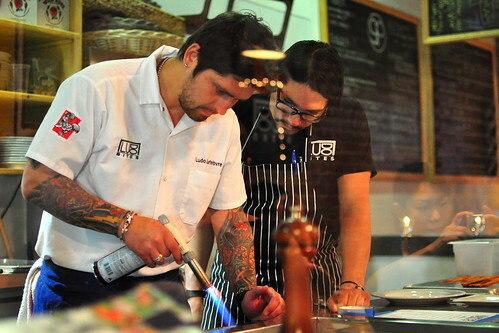 Chef Ludo Lefebvre is a rock star. For starters, he doesn’t play by the brick and mortar rules. He pops up whenever and wherever he pleases, keeping diners firmly on their toes the entire time. Furthermore, when the chef unveils his chosen venue and releases dates, every seat in the house sells out within hours. Reservation systems have been known to malfunction due to his popularity. Not to mention, the man has more groupies than David Bowie does. His most devoted fans drop in several times a month and are sure to have their menus autographed afterward. 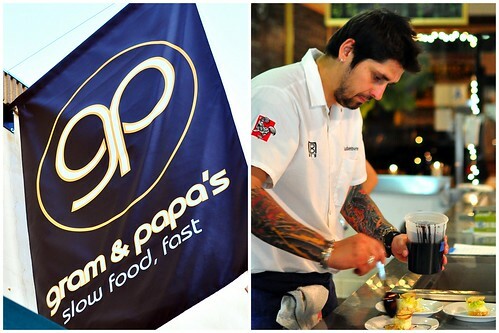 After bringing down the house at Royal/T last December and at BreadBar before that, Chef Ludo has set up shop at Downtown’s Gram & Papa’s. His two month engagement officially begins today and runs through May 28. Fortunately, I was one of a few lucky bloggers invited by Fooddigger to sit down for a sneak preview the evening before LudoBites 4.0‘s debut. The new space is incredibly intimate. Every seat in the house offers a perfect view of the open kitchen, redefining the boundaries between diners and chef. 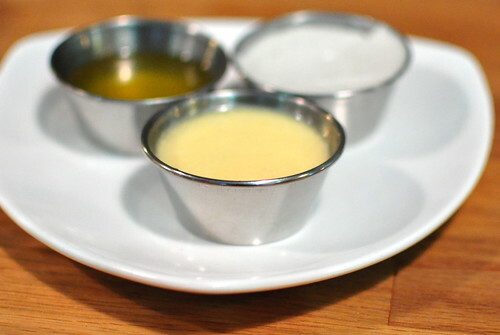 Our multi-course tasting began with individual-sized baguettes served with “Three Fat Textures.” While the clarified and brown butters were completely delicious, I found myself returning again and again to the bright white lavender-laced lard. Following the bread course was a gorgeous plate of Gastrovac‘d fruits and vegetables. 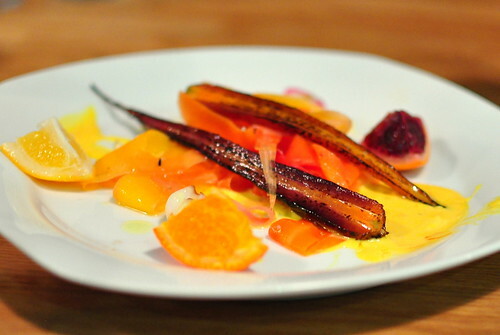 The centerpiece was a carrot salad with saffron creme anglaise. Cooked slow and low, the carrots retained their characteristic snap and sweetness. Pickled pearl onions and a plethora of citrus fruits (Meyer lemon, blood orange, Navel orange) brought pleasantly tart accents to the plate. The dish that elicited the most ooh and ahhs was the “Egg, Potato Mousseline, Lobster, Borage Flower.” Hidden beneath the impossibly smooth layer of potato puree were hunks of butter poached lobster and a soft boiled egg. The intermingling of flavors between the lobster, potato, and silky yolk had us all swooning with delight. Making its second appearance on the LudoBites tour was the foie gras croque-monsieur. The sandwich initially debuted at the tail end of LudoBites 2.0 and was brought back by popular demand. While it doesn’t look like much on the outside, Chef Ludo’s croque is something kind of wonderful. 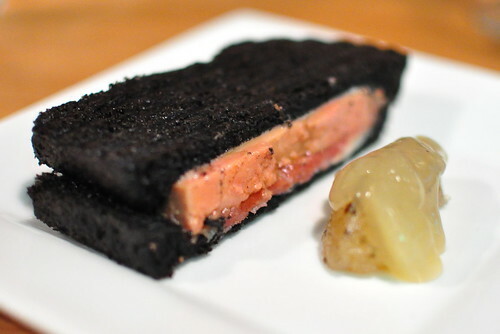 Sandwiched between two slices of squid ink-dyed bread is a luscious lobe of foie gras, ham, and cheese. 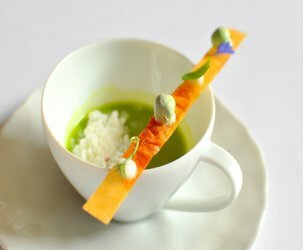 A chutney of lemon, turnip, and seaweed provided a bold punch to balance out the richness. Will Chi, one of Fooddigger’s founders, missed the sandwich so much that he proclaimed “welcome home” as he took a bite. Welcome home, indeed. 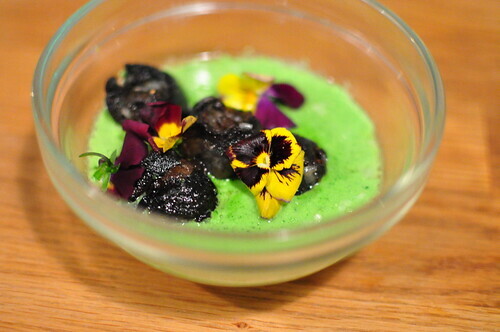 Another terrific course was the Burgundy escargots with garlic flan and parsley jus. While I can’t say that this wildly different interpretation topped the classic Escargots de Bourgogne, I did appreciate how Chef Ludo turned the standard combination of ingredients completely on its head. 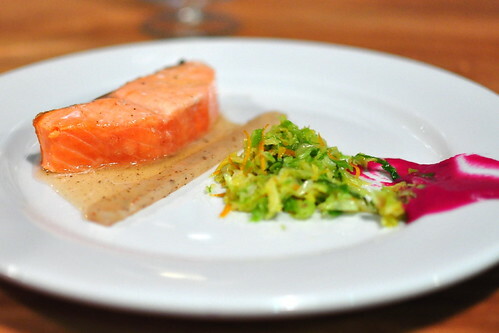 The only dish that left me wanting was the Columbian River King salmon with spring cabbage and juniper berries. While the fish was superbly cooked, the accouterments mostly fell flat and didn’t enhance the dish overall. All thoughts of the lackluster salmon completely disappeared with the arrival of the peculiarly shaped Jidori chicken. 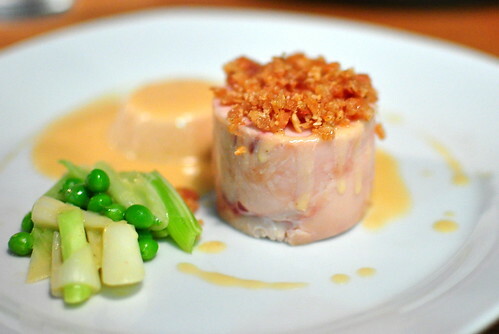 The supple slab of poached white meat was topped with bits of fried skin and hazelnuts. The deconstructed chicken was impressively moist and crispy in all the right places. Pickled leeks with English peas, as well as a phenomenal bacon pudding, were on hand to mix and mingle. Having mastered the art of fried chicken, it seems that Chef Ludo is channeling his creativity toward rethinking roasted chicken. 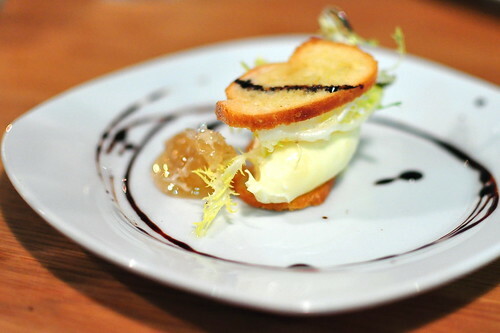 The cheese course was comprised of a brie chantilly napoleon with honeycomb, balsamic, and frisee. The rind-less brie was whipped for two hours by hand Kitchen Aid, creating a luxuriously creamy texture not unlike butter. I’ve always loved pairing honey with cheese and was pleased to have bits of honeycomb to swipe my napoleon in. The final course was a dark chocolate souffle with black pepper milk chocolate ice cream and chocolate cream. 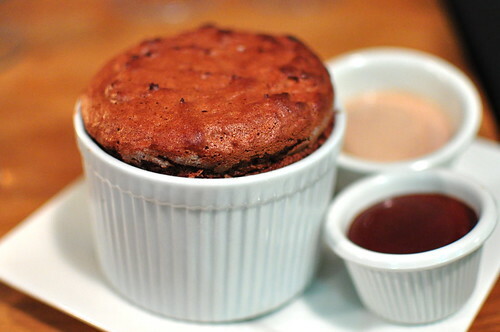 Served warm out of the oven, the souffle was light and ultra chocolaty. The black pepper milk chocolate ice cream, which was made with the most fragrant Indonesian black pepper, was surprisingly spicy and strangely addictive. In a town where every other menu is crowded with sliders, bacon, and pork belly, Chef Ludo is seeking to do something different and memorable. 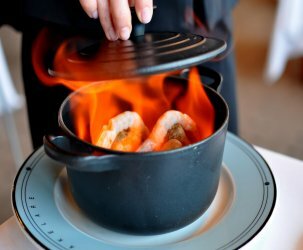 Diners and critics may not always be thrilled with his jarring juxtapositions, but he’d rather be bold and fail, than predictable and popular. The beauty of LudoBites is the ever-evolving menu. Chef Ludo promises to introduce some really provocative dishes just as soon as he’s comfortable in his new space. I can’t wait to see what he comes up with next! Definitely could not decided between the sentiment of “I can’t believe” and “I’m so happy” not “I can’t believe I’m so happy” hahaha please mentally add a slash between them! true to your word–you’re awesome!! Amazing dinner and photos without the lightbox..I’m a believer in Ludo Bites! dang it!!! I’m SOOOOO jealous of all of you that went!!!!! Once again it was a pleasure seeing you! I hope you liked the meal as much as I did! Beautiful pictures! I commend you for posting this so quickly! I have vivid images in my head of you happily devouring the croque monsieur and the black pepper ice cream. Haha. great review and loved the pics! Chef Ludo ain’t the only rockstar… you are too! Nice work busting out a post in the throes of a massive food coma. That deconstructed fried chicken sounds aaaamazing. Diana’s right, you are a rock star! As always, it was such a pleasure to see you. Thank you for being such a great supporter and friend. I still can’t believe you got this up so quickly. I barely made it into bed. Great write up and great pics. Can’t wait to see how the menu evolves. It was so great to meet you yesterday! I hope I’ll see you again soon. And congrats again! I’ll need to check out your S.O.’s blog for some recipes! Everything looks amazing! You are so lucky to have been invited to this! Dude, amazing that you were able to turn this around so quickly!! I’m super stoked that my reservation is a bit later, mostly b/c maybe he’ll come up with some more things by May 8th!! Thanks for the lovely pictures and your words are great! Cathy, great post and it was great to finally meet you in person! Cathy, I absolutely adore your blog! Your photos are amazing! After reading this post I’m eagerly anticipating checking out 4.0! Love this post! I can’t wait to go! 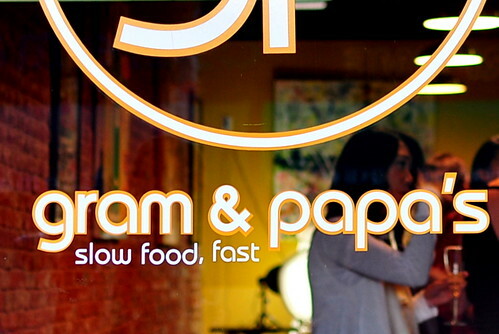 Thanks for the write-up and beautiful pics. great piks. hes such a master at visual impacts. love all the colors and i wish i could taste everything. nice descriptions too! You are so fast! I can’t wait to go too. Thanks for the preview! 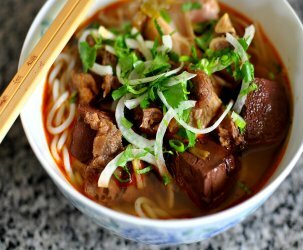 Looks sOooOOooOOo good! I’m jealous, but I’ll be there in like T minus 20 hours. Can’t wait for some Ludobites 4.0 action! Gorgeous. Can’t wait. Particularly excited re the open kitchen. Great sneak peek. As usual, some awesome pictures here. How exciting that Ludo is back! Unfortunately I’ll have to wait until May for my reservation, but it will be well worth it, I’m sure. Great Poast! It all looks incredible. Someone hand whipped that Brie for 2 hours???? Not so sure about that. 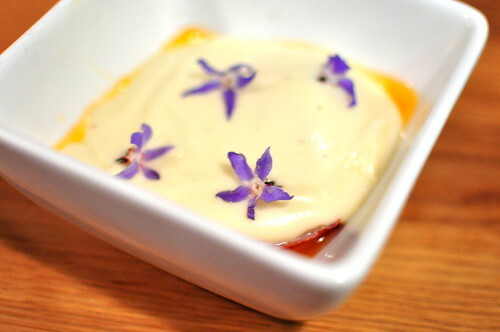 Davebr – Rumor has it that Holly of Michelin Project who is working under Chef Ludo whipped the Brie for two friggin’ hours. She is probably short one arm now, but man, that cheese was delightful! guest – I use a Nikon D90 with a 35mm f1.8 lens. Yes, I post process my images using Google Picasa. I like to play around with saturation on the camera settings to have the colors pop! What a night! As mentioned, I love your blog and it is a treat to have dined with you and seen the written outcome. Kudos. Ahh, I want to try the Jidori Chicken! I’m going there this week. I’m glad it’s closer to our area than westside. Are you planing to be the groupie that goes to LudoBites 5.0 in Thailand? LOL!! !